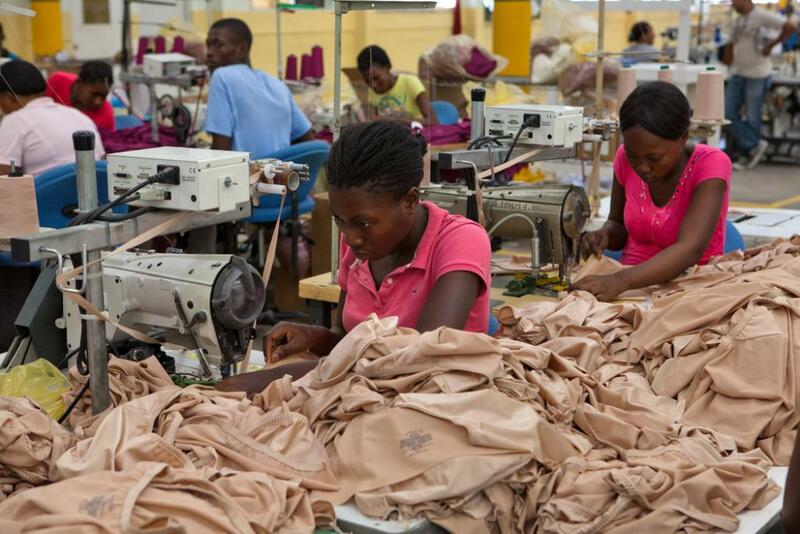 Report on a spirited North American campaign to improve working conditions for Disney textile workers in Haiti. `Heigh-ho, heigh-ho, it s off to work we go.' It's difficult to imagine that the men and women sewing Disney-branded clothing in Haiti would be singing along to the familiar tune of Walt Disney's 'Seven Dwarfs'. Take Remi for example. This shy young ~ man works for the Gilanex company, one ° of four Haitian plants subcontracted by the giant US-based entertainment empire. He spends his days operating a sewing machine making 101 Dalmatian T-shirts and other garments loved by children worldwide. He is paid according to a piece rate system which means the more garments he finishes the more he earns. If he meets the quota set by management he can reach the top rate (around 42 cents an hour). But even the best sewers only reach quota two or three times a week. When Remi was interviewed by US journalist Mary Ann Sabo he told her he had been working as a machine operator for five years but still earns just 30 cents an hour. That's the official minimum wage in Haiti and works out to $2.40 a day or $624 a year. Every day Remi walks 45 minutes to the factory from his home in one of Port-au-Prince's worst slums to save money. Even so, after buying food and water and paying for his daughter's schooling his paycheque is almost gone. The facts bear him out: much of the food in Haiti is imported and prices can match those in the West. A simple meal of rice and beans with tomato paste and bread costs a family $2.89 - more than the $2.40 that Remi earns on average each day. And that doesn't include weekly rent of $5.13 for his modest one-room house, clothes or other necessities. No wonder some workers gulp down their lunch in a few minutes so they can race back to their sewing machines to earn more money. As news of poverty-level wages earned by Disney contract workers has filtered out to northern countries, outrage has grown- along with an energetic fight-back campaign. The National Labor Committee(NLC), a New York City-based human rights advocacy group, is trying to publicize the conditions of Disney's contract factories to persuade the company to pay Haitian workers a living wage of at least 60 cents an hour. The NLC has asked Disney company brass to allow independent monitoring of the factories to make sure conditions are humane. The company is one of the largest corporations in the world and has contracts with an estimated 3,000 factories employing thousands of workers worldwide. 'Why do we have to accept the system as it is?' asks Charles Kernaghan, one of the key activists behind the NLC campaign. Kernaghan argues that the cruel treatment of Haitian workers makes a mockery of the wholesome family values for which Disney is famous. The campaign has attracted a wide circle of supporters, including human-rights activists, teachers, students, trade unionists and church congregations. An annual 'Season of Conscience' campaign, aimed at promoting shopping with a conscience, has helped alert Americans to conditions of workers who make clothes and other novelty items for the giant corporation. The NLC has also produced Mickey Mouse Goes To Haiti, a video shot in the Caribbean country which unveils the stark poverty of Disney contract workers. 'They don't treat us like human beings,' says one worker, wearing a mask for fear of company reprisals. 'The quota [of clothes to produce] is too much. When I go home I collapse. I ask God and the international community to speak up for the Haitian people.' Other workers speak of being trapped in debt all their lives just to survive. 'The day I get paid, the children still go to bed hungry,' says one. These testimonies, combined with footage of the workers' cramped, inadequate housing, have sparked thousands of US schoolchildren to write letters of protest to Disney Chief Executive Officer (CEO) Michael Eisner. Socially-responsible investment funds and church shareholders have added their support. They've challenged Disney to allow shareholders to vote on a resolution reviewing Disney's sourcing guidelines and raised the issue of whether monitoring for sweatshop conditions and human rights violations is adequate at the factories producing Disney goods. Solidarity campaigners are careful to affirm the value of Disney's contractor plants in Haiti, recognizing that the 2,000 workers desperately need to keep their jobs. Nonetheless, when workers at the LV Myles Disney contractor-factory in Haiti recently tried to organize a union, 150 were summarily fired. In 1997, the NLC rallied against a threat by another contractor, HH Cutler, to pull out of Haiti in favour of even cheaper wages elsewhere. It was no bluff. The contractor set up a maquila factory in Acuna along the US-Mexican border to sew Hercules, Lion King and 101 Dalmatians children's clothing. On investigating, the NLC found forced overtime, lack of clean drinking water and limited bathroom breaks. Getting Disney to respond concretely has also been a battle. At first the company denied employing anyone in Haiti, arguing that it merely 'contracts' work out to other employers and therefore had no responsibility for wages and working conditions. Later, management claimed contractors were paying 60 cents to 90 cents an hour, despite documented proof that found workers were earning wages as little as 12 cents an hour. Eventually, the company reluctantly agreed to send representatives to check conditions and wages at its contractor plants. However, on the key points-wage hikes and independent monitoring-the giant media conglomerate refused to budge. NLC visitors to Haiti discovered that workers had never heard of the 'Walt Disney Corporate Code of Conduct' that allegedly guarantees basic rights to workers. It's clear that the multi-billion dollar firm could easily afford to pay workers in Haiti, China and elsewhere a living wage. Disney CEO Eisner received over $185 million in pay and stock options in 1996. It would take a Haitian worker sewing Disney garments 156 years to earn what Eisner was paid in an hour. The NLC found that for every pair of Pocahontas pajamas sold in the US for $11.97, a Disney worker received just 7 cents. Disney contractors in Haiti have admitted that their profit margins are 12 to 17 per cent, triple the typical rate for US manufacturers. The plight of Disney's Haitian workers showcases the power of footloose capital in a world hungry for work. As Western multinationals roam the world in search of hefty profits they gravitate towards the very cheapest labour. Nonetheless, Kernaghan believes that consumer pressure can move the whole system forward, as it did with US clothing retailer Gap. A vigorous and noisy campaign finally forced Gap to become the first company to open its contractors' plants to independent human-rights monitors. The Disney campaign has been just as noisy but the company has chosen to close its ears. Kernaghan acknowledges that it's an uphill battle but claims a victory of sorts in that huge companies like Nike and Gap are at least being forced to respond to the growing anti-sweatshop campaign. Murray MacAdam is a community worker and freelance writer based in Toronto.